While underwater sight and sound — however muted and distorted they may be — are within our realm of experience, sharks possess a sense that is so alien to us that we can neither relate to it nor fathom what it might feel like. That sense is electroreception: an acute sensitivity to electrical fields. Sharks receive tiny electrical signals from their environment via a series of pores peppered over the head, looking like a bad case of 5-O'clock shadow. These pores are distributed in discrete patterns, varying somewhat among elasmobranch species. In the White Shark, there is a pair of elongate clusters on top of the head above the eyes, another pair of V-shaped clusters surrounding the nostrils underneath the snout, a sausage-shaped cluster under each eye, and an oval cluster extending along each side of the chin. These pores open to tiny bottle-shaped cells that are filled with an electrically conductive jelly. These cells are termed ampullae of Lorenzini, after the Italian anatomist who first described them in 1678. The ampullae are an extension of the lateral line system, and — like it — are based on hair cells as the key functional unit. Modified hair cells line the deepest part of the central lumen (cavity) of each ampulla. Instead of being responsive to bending, the klinocilium/lesser cilia mechanism of ampullary hair cells respond to a local reversal of electrical polarity. A net negative charge inside the ampullary lumen causes an electrical change in each hair cell, triggering the release of neurotransmitters to adjacent clusters of sensory nerves which, in turn, signal the brain, where the stimulus is interpreted. That the same functional unit — the hair cell — has been adapted to sensing sound, vibration, and electrical stimuli testifies eloquently on behalf of the conservatism and creativity of evolutionary processes. Seawater is an ion-rich medium that conducts electrical fields moderately well. Seawater moving over the magnetic field lines of our planet provide a weak but richly textured electrical 'map' of the immediate environment. A shark's body is contains a rich broth of electrically charged biomolecules called electrolytes, which allow cells to communicate with each other. As it swims across geomagnetic field lines, electrical currents are induced in its body that provide navigational cues. Field studies by A. Peter Klimley have revealed that Scalloped Hammerheads (Sphyrna lewini) in the Sea of Cortez use this built-in compass sense to follow 'magnetic highways' along the seafloor between separate nocturnal feeding and diurnal socializing sites. On a much smaller scale, cellular activity generates tiny electric fields that can betray the presence of potential prey that would otherwise be hidden from sharks. A particularly vivid example is provided by the Great Hammerhead (Sphyrna mokarran), which detects buried stingrays by sweeping its wide, ampullae-studded head over the bottom like the sensor plate of a metal detector. 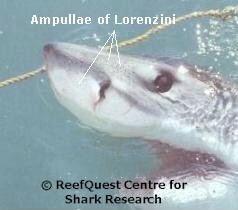 These electrical cues would be meaningless to sharks, were it not for the astonishing sensitivity of their ampullae. Studies by Adrianus Kalmijn, a pioneer in elasmobranch electroreception, have demonstrated that some sharks — such as Smooth Dogfish (Mustelus canis) — are able to detect low frequency (from about 0.5 up to 8 Hertz) electric fields as tiny as 5 nanovolts (billionths of a volt) per square centimetre. In 1998, graduate student Steve Kaijura demonstrated that newborn Bonnethead Sharks (Sphyrna tiburo) can detect electric fields less than 1 nanovolt per square centimetre. This is equivalent to the electric field of a flashlight battery connected to electrodes some 10,000 miles (16,000 kilometres) apart in the ocean. Such incredible electrical sensitivity is over five million times greater than anything you or I could feel and is by far the most acute in the Animal Kingdom. Testing the upper and lower limits of electrosensitivity in the White Shark requires precise measurements under controlled conditions that are presently only available in laboratory aquaria. Unfortunately, all attempts to maintain a Great White in captivity have thus far proved unsuccessful. The current record for survival in captivity, held by the Sea World Aquarium in San Diego for a 5.5-foot (1.7-metre) specimen, stands at a mere 16 days. But most captive White Sharks fare far worse. To date, most White Sharks have died within a few hours of being placed in an aquarium tank. Despite this logistical hurdle, some intriguing quantitative and qualitative observations suggest that the White Shark is highly sensitive to electric fields and that this ability is important to its survival in the wild. The 72-hour captivity of a 7.5-foot (2.3-metre), 300-pound (136-kilogram) female White Shark at San Francisco's Steinhart Aquarium during August 1980 provided an unexpected opportunity to measure the electrosensitivity of this species. Dubbed 'Sandy', the juvenile Great White was displayed in Steinhart's torus-shaped 'fish roundabout', becoming an instant media celebrity and drawing some 40,000 visitors to the Aquarium over a three-and-a-half-day period. By the fourth day of her captivity, Aquarium director John McCosker noticed that Sandy continually collided with a particular five-degree arc of the tank. No visual, sonic, or vibratory cues were discernible at that particular segment of the roundabout. So McCosker and his co-workers suspected that a weak electrical field at that location might be causing her to bang her head against the tank wall. A silver-chloride half cell was used to detect a small electric potential difference between two of the tank's windows measuring 0.000125 volts — an amount so tiny that none of the other sharks in the roundabout seemed to notice. Correcting the problem would have required removing all the fish and draining the tank, so it was reluctantly decided to release Sandy at the Farallon Islands, a location that provided suitable habitat yet was far enough away so as to not endanger San Franciscan swimmers and surfers. In addition to providing hope that another of her species may one day be maintained in captivity, Sandy provided an important clue about her electrosensitivity. Thanks to Sandy and the husbandry team at Steinhart Aquarium, we now know that White Sharks can detect electric fields at least as minuscule as 125 microvolts (millionths of a volt). Although the White Shark's electrosensitivity may create problems for it in captivity, this ability probably helps it to survive in the wild. For example, pinnipeds (seals and sea lions) often haul out in large numbers on craggy rock islands that are geologically young. Such islands are often created by tectonic activity which leaves an enhanced magnetic signature with meandering lines of force radiating from them for many miles. White Sharks may, in part, locate pinniped rookeries (mass breeding sites) by following these 'magnetic highways', much as Scalloped Hammerheads locate nocturnal feeding sites in the Sea of Cortez. The White Shark's electrosensory talents may also help it capture prey. When a Great White bites into prey, its eyes roll tailward in their sockets to protect them from physical damage. Thus, at the moment of strike, the White Shark is temporarily blind. It may therefore rely on electrical cues to keep track of where its prey is at all times. Not only can the shark detect the electrical signature of its prey's metabolizing cells, but — once it is wounded — the prey leaks charged electrolytes into the environment, creating an electric field as much as three times stronger than that of uninjured prey. In the bloody, thrashing confusion of a predatory attack, the White Shark's acute sensitivity to electric fields may provide what JAWS author Peter Benchley called, "a beacon as clear and true as a lighthouse on a moonless night".